Welcome to the first edition of the Inclusive Growth Bulletin in 2019! We start this issue with a new study: “Social Protection in Asia and the Pacific: Inventory of non-contributory programmes”. It provides an overview of social protection programmes currently being implemented in 19 low- and middle-income countries of the East and South Asia region and 11 countries in the Pacific Islands. In total, 215 programmes were mapped in 30 countries, of which 141 have been profiled. The study was jointly produced by the IPC-IG and UNICEF Country Offices in Asia and the Pacific, with the support of Australia’s Department of Foreign Affairs and Trade (DFAT). Read more here. It is available as a free download in English, in PDF and smartphone/tablet-friendly formats. An Executive Summary is also available. A companion One Pager is available in English and Portuguese. In the Working Paper "How can cash transfer programmes work for women and children? A review of gender- and child-sensitive design features", authors Anne Esser, Charlotte Bilo and Raquel Tebaldi (IPC-IG) seek to outline good strategies and practices in designing and implementing gender- and child-sensitive cash transfer programmes, based on international experience. The study focuses on programme features, highlighting the importance of anticipating effects on women and children during each step of programme design, implementation and evaluation. A companion One Pager is available in English and Portuguese. 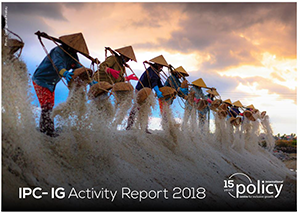 Finally, we are glad to present the IPC-IG’s 2018 Activity Report, outlining our research projects, knowledge products, and outreach activities conducted in the past year. By disseminating this Activity Report, the Centre seeks to account for its work and inform stakeholders, partners, donors, and society in general, by providing transparent and accurate information on all the projects and activities conducted over the past year. We are grateful to all of our contributors and partners for their support. This publication is available in English and Portuguese. Socialprotection.org has a new look! Our colleagues and partners at the socialprotection.org platform have kicked off 2019 with plenty of new developments. First, the platform has been revamped with a new look and improved features, such as a new global search, a new social space, redesigned Online Communities and e-learning hub, among other features. Check it out here! On the subject of learning and knowledge, Senior Project Officer Mariana Balboni and Knowledge Management Assistant Marina Carvalho participated in the TRANSFORM Review Meeting in Lusaka, from 14 to 18 January. The TRANSFORM course is currently on its third edition and it is hosted on the platform. 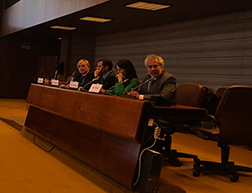 In Geneva, on 5 February, Ms. Balboni joined the High-Level Conference: “Together to achieve Universal Social Protection by 2030 (USP2030)”, which was livestreamed through socialprotection.org. If you missed it, watch it here. Later, on 7 February, she joined a SPIAC-B meeting in the same city. Capping February off, the platform will host the webinar "Realising rights: how can social protection advance gender equality? ", on the 19th. Register for free here. 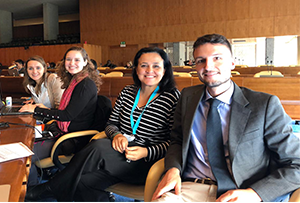 On 7 February, a team of IPC-IG researchers took the stage at the International Conference on Universal Child Grants, held in Geneva, to share knowledge on child-sensitive social protection. Some of the sessions were streamed live on the socialprotection.org online platform, and you can review and watch them here. Researchers Anna Carolina Machado and Charlotte Bilo presented “Cash Transfer Programmes in MENA from a Child Rights Perspective”, sharing the main findings of a series of studies recently published by the Centre, including the latest issue of the Policy in Focus magazine: “Social protection: meeting children’s rights and needs”. Researcher Mario Gyori presented a study co-authored with our Senior Research Coordinator, Fábio Veras: "Universal Social Protection in Tunisia: Comparing the Effectiveness and Cost-efficiency of Food and Energy Subsidies with A Proposed Universal Child Allowance Programme". This study was published in a special issue of the International Social Security Review (ISSR) journal, titled "Social protection in the MENA countries: Prospects for a new social contract?" Finally, IPC-IG Senior Research Coordinator and Ipea researcher, Sergei Soares, discussed the Brazilian experience of Bolsa Família: “Towards a universal child benefit in Brazil: What needs to be done and what can be expected?”. (Read IPC-IG's publications on Bolsa Família here). The Centre would like to congratulate our colleagues at UNICEF for the recently released report "Realizing Children's Right to Social Protection in the Middle East and North Africa: a Compendium of UNICEF’s Contribution". The Compendium documents the broad range of UNICEF’s social protection interventions in the MENA region from 2014 to 2017, presenting 20 case studies detailing the UNICEF's contribution. Among them, it acknowledges the partnership with the IPC-IG regarding the work developed in Morocco, Djibouti and Egypt. The Centre is grateful for this partnership. 15 years and counting: IPC-IG Introduces its new visual identity! We are proud to present a new visual identity to commemorate the IPC-IG’s 15 years as a global forum for South-South dialogue on innovative development policies and to mark the start of celebrations over the coming months. Readers will find the new logo in all of the Centre’s knowledge products, from the popular One Pagers to our flagship magazine Policy in Focus, as well as on our website and social media channels. Read more here. Our Senior Research Coordinator Rafael Osorio travelled to Cairo, from 2 to 11 February, for technical meetings with the Ministry of Social Solidarity’s monitoring and evaluation (M&E) team. The objective was to share the recent work conducted by the Centre regarding the development of a new M&E reporting tool and devising better ways to use the available data. Along with UNICEF Egypt, the Centre is working to improve the child sensitivity of the M&E systems of Egypt’s flagship cash transfer programmes, Takaful and Karama. 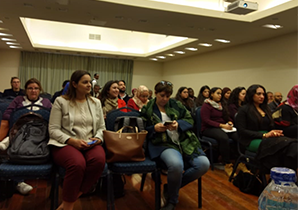 Precisely, these Egyptian programmes and the Brazilian conditional cash transfer programme Bolsa Familia were the topic of a presentation delivered by Mr. Osorio to students at the American University in Cairo, on 7 February.